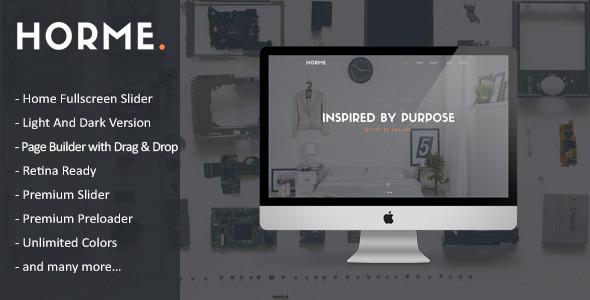 Horme is a Modern and Creative premium WordPress Theme.Design Theme is made in a beautiful style. It is suitable for Personal Portfolio, Creative Agency, Designer Portfolio, Illustrator Portfolio, Photographer Portfolio and more.Theme has a universal design, it thought every detail and animation effect. Its just as easy to customize to fit your needs, replace images and texts. Horme with three versions. You can freely choose according to their own. The wordpress theme is responsive, you can view it also in the mobile/tablets devices and it looks very in more devices. Horme is a perfect theme for a variety of uses from blogs to personal or business portfolios. What are you waiting anymore let experience “Horme” our theme. Page Builder with Drag and Drop layout. Home One Page Dark Version. 2 Portfolio Page Examples Built-In. -  Fix Bug Some hosts do not install plugins: Aqua-Page-Builder.